The Glass House welcome two distinguished names in architecture for cocktails, lunch, and a conversation about the state of architecture and the history of the Glass House as we commemorate its upcoming 70th anniversary. This event will be held at the newly reopened Four Seasons Restaurant designed by architect Isay Weinfeld. 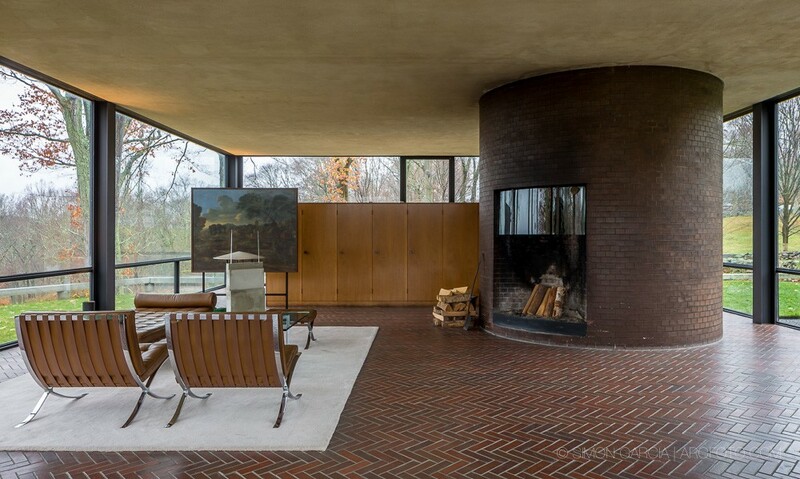 Ticket sales benefit important preservation projects at the Glass House. Tickets include reception, conversation with Frank Gehry and Paul Goldberger, and seated lunch featuring Krug Champagne. Tickets, tables and donations are tax deductible to the fullest extent allowable by law. For inquiries, please contact Isabel Richards at irichards@theglasshouse.org or 203.978.3011. Current projects include the King Street Development in Toronto, Ontario; the Grand Avenue Project in Los Angeles, California; 8150 Sunset in Los Angeles, California; the Ocean Avenue Project in Santa Monica, California; the World Jewish Museum in Tel Aviv, Israel; the Los Angeles River revitalization project in Los Angeles, California; a new center for the Youth Orchestra Los Angeles (YOLA) in Inglewood, California; and single-family residential projects in Atherton, California; Los Angeles, Californi; and Cabo San Lucas, Mexico. The Glass House is proud to announce an opportunity to hear from two of the world’s most preeminent architects, Norman Foster and Robert A.M. Stern. Beginning with their youthful relationship studying architecture at Yale in the early 1960s, these men have known each other since the very beginnings of their illustrious careers. Each has exerted a global influence on buildings as well as the urban environment overall. For this fundraising event, they will discuss both their shared history as well as their vision for how architecture can contribute to a more sustainable environment and how the role of the architect is evolving in response to global issues today. Preservation, this intimate conversation and dinner benefits preservation at the site. Ticket includes cocktail reception, conversation with Norman Foster and Robert A.M. Stern, and dinner featuring Krug Champagne. Join curators David A. Hanks, Juliet Kinchin, and Hilary Lewis for a discussion about the furniture inside the Glass House, much of which derives from Philip Johnson’s 1930 New York apartment designed by architect Mies van der Rohe and Lilly Reich. Lynn Davis: On Ice presents a selection of photographs from the artist’s longstanding engagement with the icebergs on the sea outside of Ilulissat, a small town on the edge of a glacier off the west coast of Greenland. Developed over the course of six expeditions that began in 1986, Davis’s photographs evidence strong affinities with the spare geometry of minimalist sculpture and track the dramatic transformation of the natural environment. 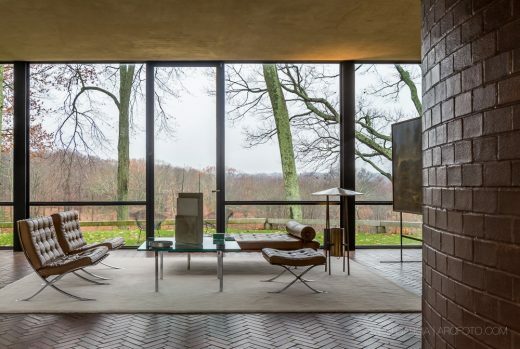 As the Glass House commemorates its 10th year as a site of the National Trust for Historic Preservation, the exhibition additionally celebrates Davis’s friendship with David Whitney and Philip Johnson, both of whom collected the artist’s work. We are celebrating the 111th anniversary of Philip Johnson’s birth this Saturday, July 8th with the release of the new Modernist Paperweight designed by Werkstätte Carl Auböck Vienna exclusively for the Glass House Design Store. Inspired by Philip Johnson’s iconic glasses, these life-sized “spectacles” were lovingly created for us by Carl Auböck lV and are available in patina or polished brass. Each piece bears the official Auböck stamp and comes with exclusive certification from the Werkstätte Carl Auböck. 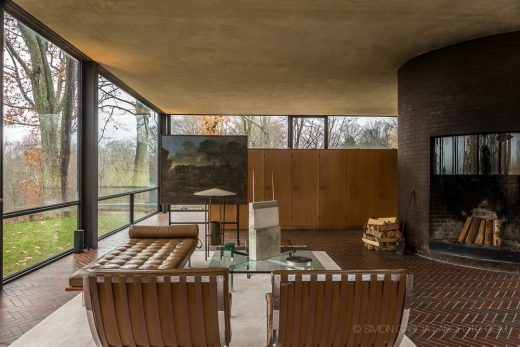 Truly an amazing “must have” for any mid-century aficionado, architectural enthusiast, design lover, or collector. Limited quantities available. Elaine Lustig Cohen was highly regarded as a graphic designer, artist, and rare book dealer throughout her career, which spanned over fifty years. In 1955, she began her design work in New York by extending the idiom of European modernism into an American context for her diverse clientele of publishers, corporations, cultural institutions, and architects. Her first client was Philip Johnson – architect of the celebrated Glass House (1949) in New Canaan, Connecticut – who commissioned her to design the lettering and signage for the iconic Seagram Building. The two forged an important bond that resulted in a variety of projects for the Glass House, Yale University, and Lincoln Center, among others. 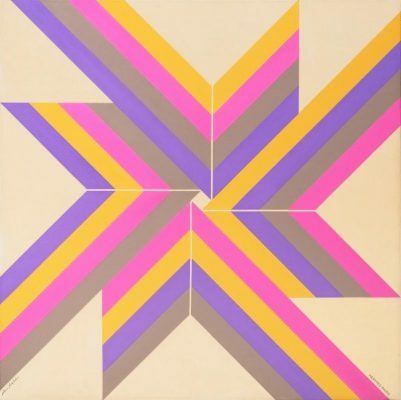 As a painter, Lustig Cohen developed a hard-edged style in the 1960s and 1970s that asserted the canvas’ flat surface. She continued to experiment with bold colors, linear patterning, and abstract shapes in a variety of media including collage and three-dimensional objects. 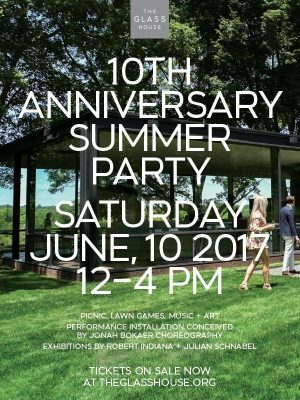 10th Anniversary Glass House Summer Party, June 10, 2017 – Tickets on sale now! The Glass House, a site of the National Trust for Historic Preservation, is pleased to announce the appointment of Hilary Lewis as the site’s Chief Curator & Creative Director starting January 17, 2017. 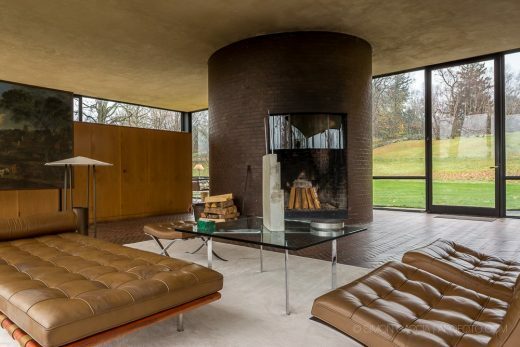 Lewis has spent more than two decades focused on the work of Philip Johnson. As an architectural historian, curator and journalist she has researched, presented and written many materials on Johnson since her first collaboration with the architect in 1992. She spent over a decade working directly with Johnson on texts, exhibitions and a multiyear project of recording his memoirs. 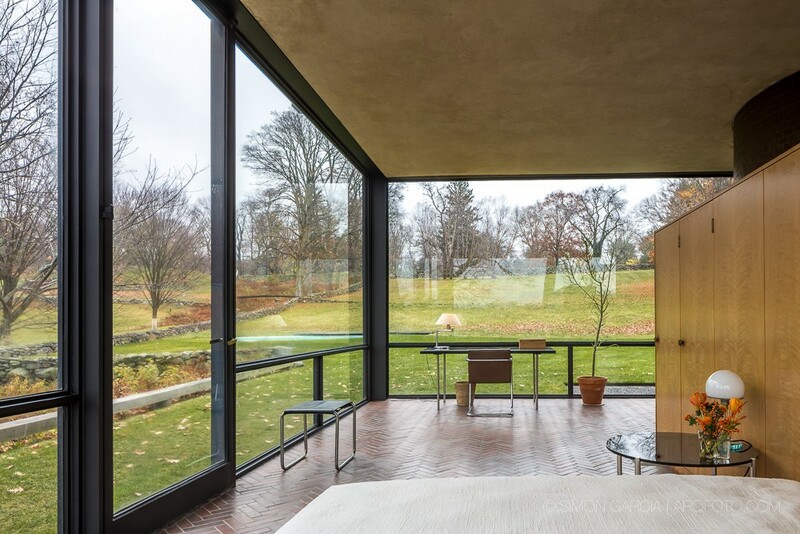 “Hilary Lewis has influenced the Glass House site since its inception as a public museum. She will be a great addition to a great team. I look forward to her continuing contributions in programming content, visitation alternatives, site interpretation and team management.”, said Gregory Sages, Executive Director at the Glass House. Lewis received her training in architectural history and urban planning at MIT and Harvard, where she also taught. 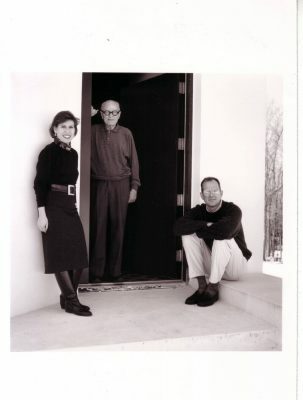 Since that time, she has co-authored Philip Johnson: The Architect in His Own Words and The Architecture of Philip Johnson, the former receiving the 1995 AIA International Architecture Book Award. 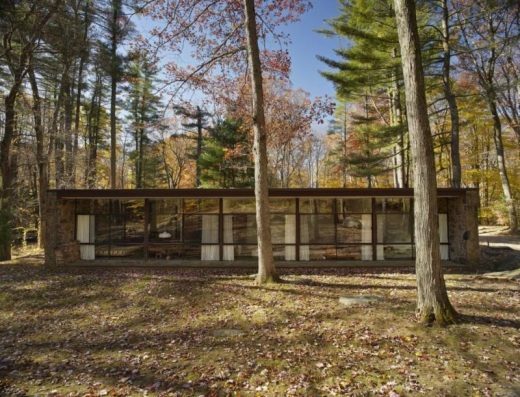 As an author, she has contributed to a variety of books on architecture and planning and has been a founding editor of four magazines on architecture and design, which deepened her knowledge and experience relating to Midcentury Modern architecture. Overall, her work addresses the public aspects of architecture, preservation and design. As a curator, Lewis developed the show and catalog Philip Johnson: Architecture + Art for the Johnson-designed Kreeger Museum. In 2007, she was named the Philip Johnson Scholar at the site. Until recently, Lewis served on the Glass House’s Advisory Council. The Glass House was the start of Philip Johnson’s fifty-year odyssey of architectural experimentation in forms, materials, and ideas, through the addition of other structures. These include the Brick House/Guest House, Pond Pavilion, Painting Gallery, Sculpture Gallery, Ghost House, Library/Study, Da Monsta, and the methodical sculpting of the surrounding landscape. The campus serves as a catalyst for the preservation and interpretation of modern architecture, landscape and art. 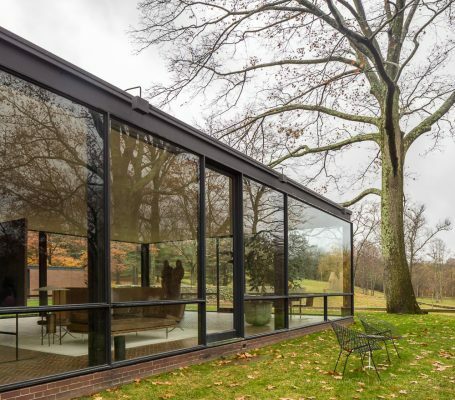 Glass House Presents is an ongoing series of public programs – including conversations, performances, and gatherings – that sustains the site’s historic role as a meeting place for artists, architects, and other creative minds. Before each event, visitors will enjoy the opportunity to explore the Glass House campus and view current exhibitions, including Fujiko Nakaya: Veil. The program concludes with light refreshments. Public programs take place from 3:00 to 5:30 p.m. on Sundays, and 5:30 to 8 p.m. on Thursdays. Glass House Presents is generously supported by an anonymous donor. May 4, 2014, 3:00 – 5:30 p.m.
lucky dragons is an ongoing collaboration between Los Angeles-based artists Sarah Rara and Luke Fischbeck. Active since 2000, lucky dragons is known for an open and participatory approach to making music, radically inclusive live shows, and playful, humanistic use of digital tools. Photo by Tom Hall. Night Sounds #4 is generously supported by a grant from the Graham Foundation for Advanced Studies in the Fine Arts. May 13, 2014, 6:30 p.m. Renowned artist Fujiko Nakaya, known for her pioneering use of fog as a sculptural medium, is joined by Henry Urbach, Director of the Glass House, to discuss the artist’s current project, Fujiko Nakaya: Veil, on view at the Glass House through November 30. Fujiko Nakaya: Veil is generously supported by the National Endowment for the Arts, the Robert Rauschenberg Foundation, The Japan Foundation, and Oldcastle BuildingEnvelope®. Additional support is provided by Mee Industries, Inc.
Self-guided tours of the Glass House offer visitors a unique opportunity to experience the Glass House campus at their own pace. 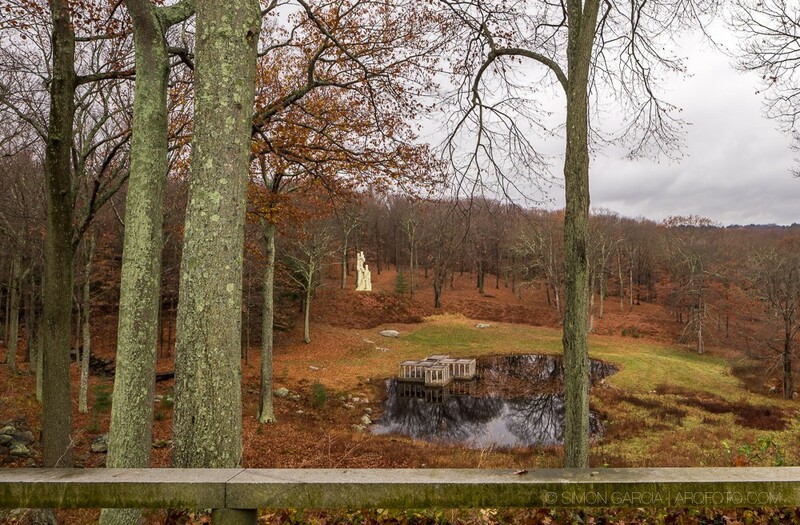 In addition to the permanent art collection and temporary exhibitions, visitors enjoy access to seven structures designed by Philip Johnson, including: the Glass House, the Painting Gallery, the Sculpture Gallery, Da Monsta, and the Library, as well as the lower landscape’s Pond Pavilion and Lincoln Kirstein Tower. Photo by Carol Highsmith. The Glass House Summer Party will take place on Saturday, June 14 from 12 noon to 4 p.m. With support from Swarovski, the Summer Party will feature a festive picnic lunch, lawn games, music, and a silent auction along with opportunities to experience Fujiko Nakaya: Veil and the entire Glass House campus. The Glass House, a site of the National Trust for Historic Preservation, is pleased to announce the opening of E.V. Day’s SNAP!, an exhibition for the building known as Da Monsta, as well as the debut of a new sculpture by Tauba Auerbach, Gnomon/Wave, for the ongoing exhibition Night (1947 2015), a project that brings a single contemporary sculpture inside the Glass House itself. SNAP! is a site-specific exhibition by New York-based artist E.V. Day. 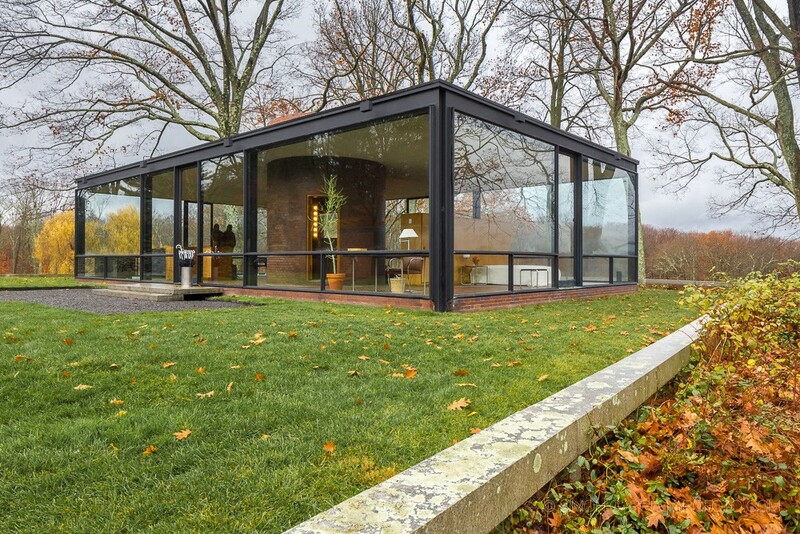 Conceived for the building known as Da Monsta (1995), the last building completed by Philip Johnson on the Glass House campus, SNAP! comprises four recent sculptures as well as site-specific installations for the building’s interior and exterior. E.V. Day is the first artist the Glass House has invited to reinterpret the building, originally intended as a visitor center and now used as a project space for contemporary art. Upon arrival at the Glass House, visitors will immediately encounter Day’s reinterpretation of Da Monsta. Responding to Philip Johnson’s statement that “the building is alive,” Day boldly casts a series of massive red nets across its undulating volume, capturing and staking Da Monsta to the ground. The interaction between artwork and building continues inside. 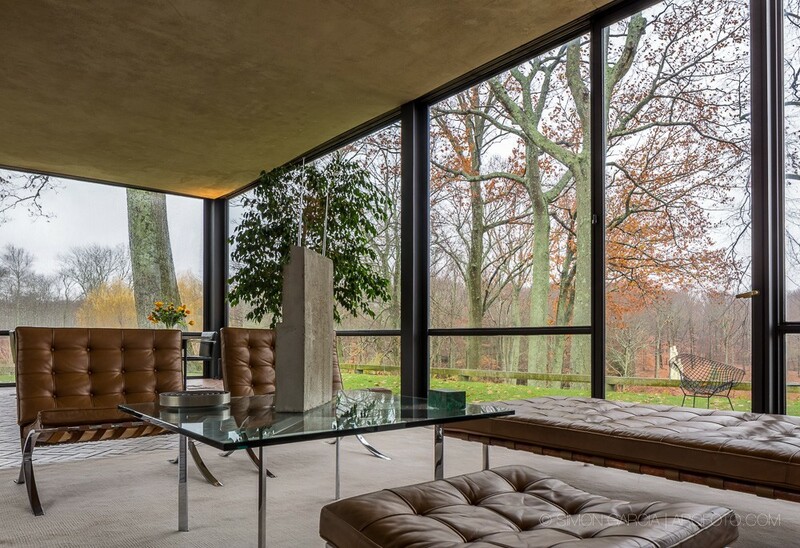 New Canaan, Conn (August, 2012) – For the first time since Philip Johnson lived in his iconic Glass House, fresh flowers will be on display there, bringing new life to the building’s interiors. The Glass House has launched a program, announced by Director Henry Urbach, to reintroduce fresh flower arrangements, which have not been seen in the house since Philip Johnson’s and his partner, David Whitney’s, passing in 2005. Local designer Dana Worlock will reinterpret Whitney’s original plant selection, adding and adapting to suit the specific environmental conditions and seasonal changes of the Glass House. The flowers, mostly gathered from the site and chosen based on archival photographs, will be integrated back into the Glass House as a symbol of new life to come: this program is the first of several initiatives being launched to rededicate the site as a lively, creative cultural center in keeping with the spirit and values of its former occupants-Johnson, the renowned architect, and Whitney, who was an editor and independent curator. 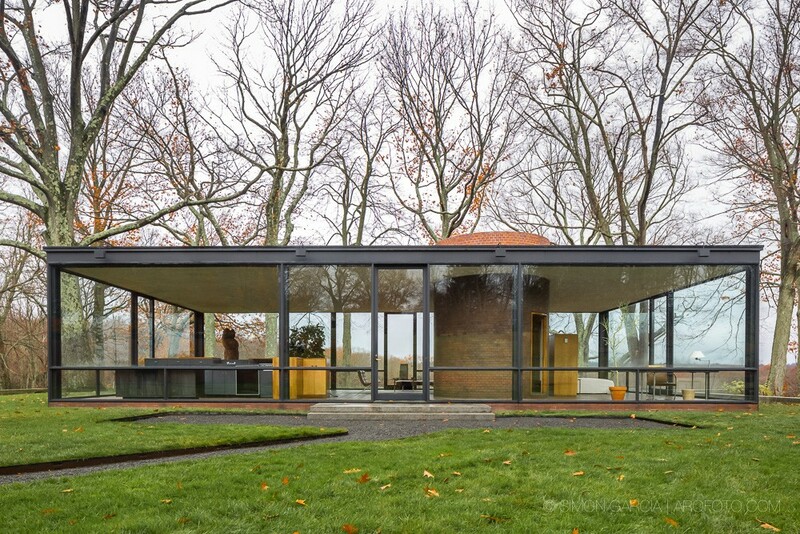 “It’s about providing our visitors with an even richer experience and celebrating renewal as the Glass House transforms from a house museum to a living intellectual and cultural center. Even this modest element reflects a way to explore new opportunities for creative engagement. During Philip’s and David’s lifetime, the Glass House nearly always had fresh flowers, and we wanted to honor this legacy. We’ve consulted historical photographs; as much as possible, we remain close to their sensibility and use flowers gathered from the site,” Urbach said. Henry Urbach, Director of The Glass House, and Dana Worlock, designer, with fresh flowers at The Glass House, 2012. An avid gardener since childhood, David Whitney cultivated a wide range of seasonal plants throughout the site’s 49 acres of lawns, meadows, woods, wetlands, and gardens. Whitney and Johnson enjoyed cuttings throughout the year when they were in residence in New Canaan. This exciting new program is generously supported by Architectural Digest magazine. Fresh flowers at The Glass House, 2012. This project won the Gold Medal from the AIA Philadelphia Chapter and was shortlisted in the New/Old Category at the 2011 World Architecture Festival.